We riders often talk about the shape of our noggins in terms of what brand fits. I’ve got a Shoei head, and while other brands also fit me well, I’ve been a Shoei devotee of sorts since I started riding on the street. Well, once I started wearing a helmet on the street, that is. I know, I know… you’re surprised (and perhaps disappointed?) that I’m still here. But enough lecturing—as An says, we’re pretty well on the ATGATT side of things here at CityBike, what with all the riding fast and taking chances. We like to protect what’s left of our brains, and as such, we take helmets very seriously. 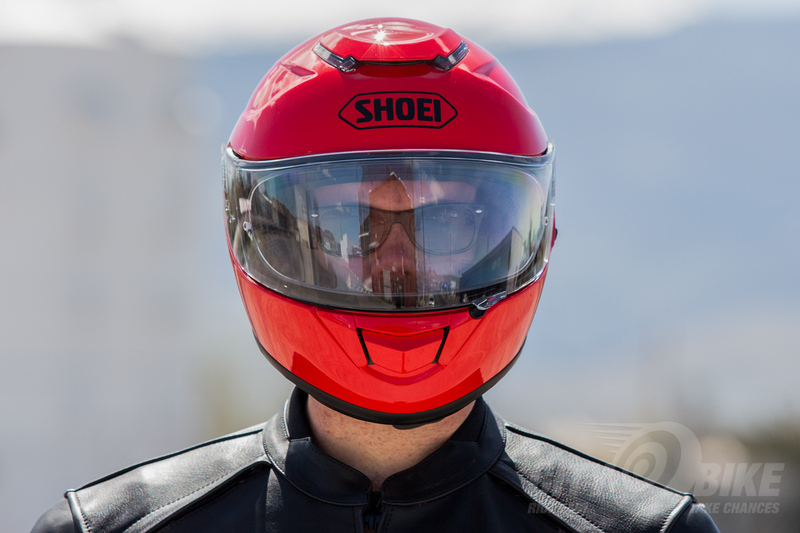 The Shoei GT-Air is a serious helmet, with serious features for serious riders. Seriously. While it’s not as conservatively shaped as an old school spaceman RF200, it—thankfully—eschews the complex and overwrought angularity of many newer lids, with just one significant contour in the shell on either side of the top vent. The rest of the exterior is pretty, well… organic. Maybe it’s the “organic fibers” Shoei mixes in with the fiberglass, to make it “incredibly strong” while still “extremely lightweight.” The size large I tested weighed in at 3 pounds, 10.6 ounces, with the chin curtain and Pinlock insert installed. Really light helmets come in under 3 pounds so I’m gonna say not quite on the “extremely” part of lightweight, but since I wear a Neotec with a Sena hanging off of it most of the time, the lightweightness admittedly feels pretty extreme to me. In any event, it’s light enough to be comfy. The GT-Air gets the air in via two vents—one on top, and one on the chinbar—and lets it back out via a single exhaust vent just above the built-in spoiler in the back. The vent mechanisms are easy to use with gloves on, and provide very good airflow without a lot of noise—an improvement over my Neotec, which has an audible hissing sound when the vents are open, even with custom earplugs in my earholes. On a naked bike, opening the vents on a GT-Air results in only a nearly imperceptible difference in road noise—no hissing to speak of at all. It’s a very quiet helmet. A chin curtain and breath guard are supplied, but I’ve always found that the breath guard actually contributes to more fogging of my glasses, rather than less. Fortunately, real anti-fog tech is included for the shield, in the form of a Pinlock insert. Kudos to Shoei for including Pinlock-ready shields and inserts with their helmets—this system works, and at $549 and up, the inclusion of this stuff helps to dull the pain of emptying your wallet at the bike shop. Visibility out of the CNS-1 shield (same shield used on the Neotec) is good. The eyeport is not as wide-open as an off-road lid, of course, but the edges of the shell don’t intrude too much. If you’re a four-eyed rider like me, you’ll be happy with how easy it is to wear glasses with the GT-Air. The internal sun-shield is easy to engage, and a real boon when heading into the sun. It’s far enough from your face that if you’ve got a thing for chunky glasses, they’ll still fit. At least mine do. Looks good with a classic leather jacket and cruiser. Comfort and fit are first rate—I do have a Shoei head, after all. The padding is luxurious, yet firm. The removable interior offers excellent padding around the base of the helmet, helping to block out noise and providing a solid, positive fit. Cheekpads are available in different thicknesses to allow customization of fit. 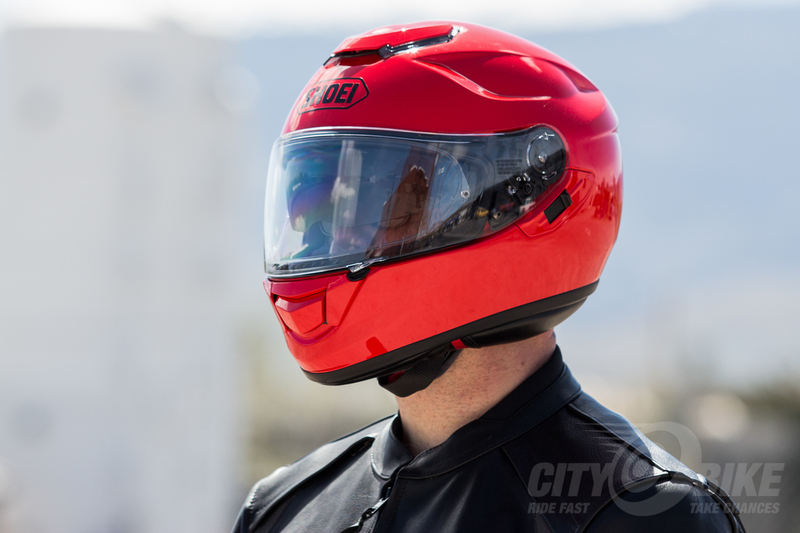 There’s an emergency release system to make the helmet easier to remove in the unfortunate event of a significant crash. 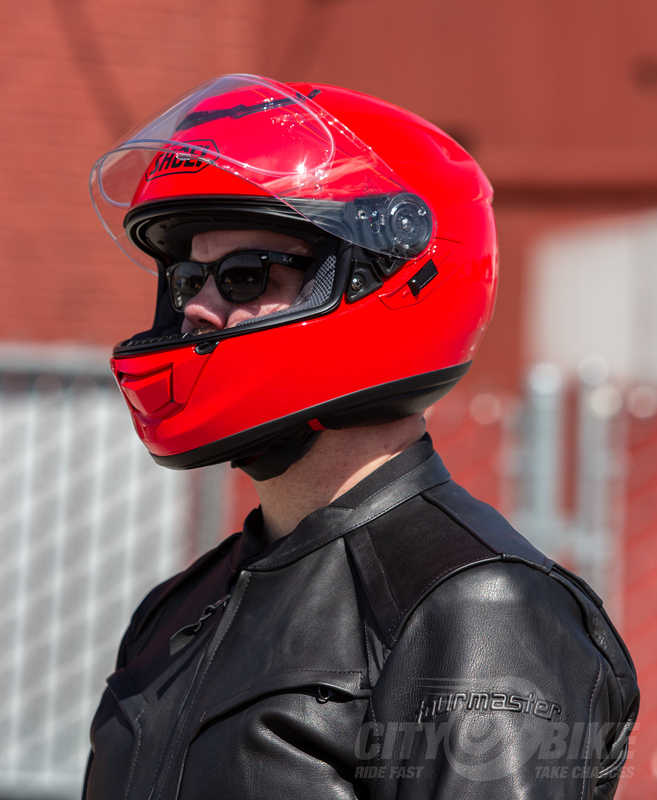 The removable liner and cheekpads are a big deal—I ride a lot, and my helmets tend to get kinda gross after a while, well before they’re worn out. A completely removable interior allows me to wash the padding to get rid of that “not so fresh feeling,” and replacing the liner makes it feel like a brand new helmet again, a couple years in. As with the inclusion of the Pinlock insert, not having to replace a perfectly serviceable helmet because it’s gotten funky helps justify the significant outlay of cash required for a helmet of this quality. Speaking of quality, the paint on my helmet is top notch. The “Shine Red” color is brilliant and bright, almost high-viz, as you can certainly tell in our bitchin’ black and white photo. It’s quite impressive. Interestingly, the GT-Air is of course DOT standard compliant, but there’s no Snell sticker. It’s not an issue for us here at CityBike, but some people may balk at dropping this much cash on a non-Snell helmet. We say “whatever” to that. 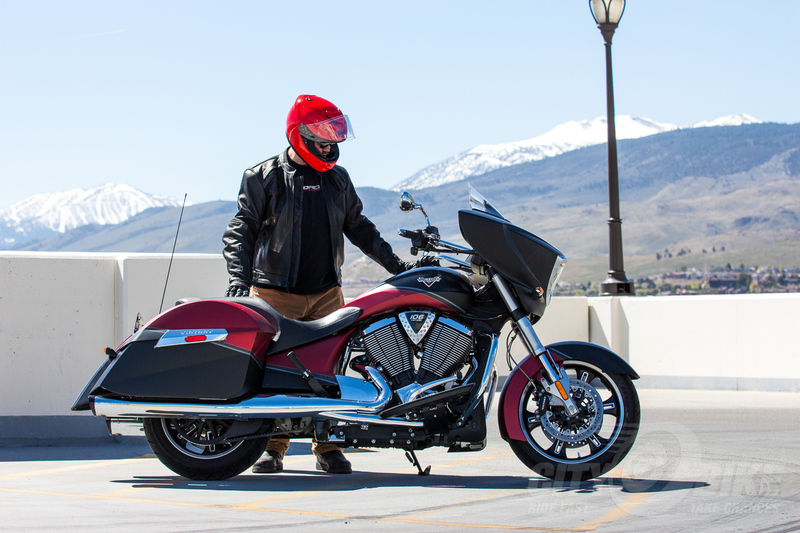 The GT-Air offers a very high level of fit and finish in line with its price, and is an outstanding choice for general purpose street riding, from commuting to weekend jaunts in the twisties to touring. Highly recommended. $549.99—more if you want fancy paint, fancy boy. Get more info and find out where to buy at shoei-helmets.com. This story originally appeared in our June 2015 issue.